You know about Rapa Nui — you might just think of it as Easter Island. That’s the name that a Dutch man gave it, because he first saw it on Easter weekend. Everyone else calls it Rapa Nui. Sitting in the middle of the Southeastern Pacific Ocean, Rapa Nui covers only 63 square miles. To put that in perspective, the island of Manhattan, New York is 34 square miles. Maui, Hawaii covers 727 square miles. For such a tiny place, Rapa Nui has has a huge impact on the world. It was first inhabited by Polynesians around the time that Hawaii was discovered by folks traveling the seas in canoes. Archeologists can’t agree when exactly that was, but sometimes between 1000 and 1300 years ago. Around the time that gunpowder was invented in China, Muslim armies invaded Spain, and the Japanese city of Kyoto was founded! Meanwhile on Rapa Nui, the Polynesian people was busy developing a rich cultural practices and complex political structures. It was often very violent, as the people waged war with each other. But the people were certainly worse off once Europeans arrived there! Many people (even the son of the great king Nga‘ara, named Kai Mako‘i ‘Iti) were kidnapped and sold into slavery by French and Spanish slavetraders. It wasn’t until the 1960s that many indigenous Rapa Nui people were allowed to return to their homeland. They continue to fight for their rights to this day. One of the most famous aspects of Rapa Nui culture was — and continues to be — centred around the Moai. Moai are the enormous stone sculptures that remain in place around the island. They stand as high as ten metres and weigh as much as 82 tons. They were carved to represent ancestors, who the Rapa Nui hold in great respect. Many people think of the Moai as heads, but they have bodies too! The bodies are mostly buried underground, but recent excavations are revealing the wonderful work hidden in the ground for hundreds of years. Today there are about 3,800 people living on Rapa Nui. About 60% of them are indigenous Rapa Nui, and many others are married into indigenous families. Though the island is now governed by the Latin American nation of Chile, it retains its distinctly Oceanic nature. 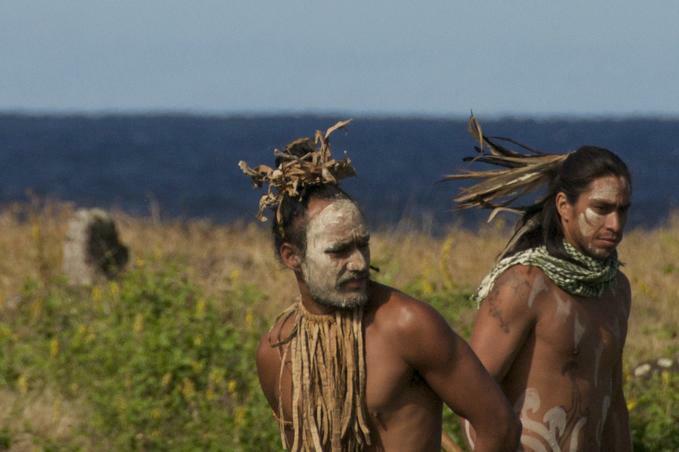 To learn more about the people of Rapa Nui, visit SaveRapaNui.org.